This study determined whether the estuarine and freshwater environment in Beira, Mozambique, serves as a reservoir of Vibrio cholerae Ol and O139. Ninety-nine estuarine water samples were collected at 6 sites in Beira. An additional 54 samples were collected from rural areas around Beira which included 3 freshwater lake samples, 15 river, 5 pond, and 4 estuarine water samples, and an equivalent number of sediment samples, collected from the same sites as the water sam ples. In addition, fish scales from 5 ocean fish and 1 deep sea water sample were also collected. The samples were analysed for the presence of V. cholerae O1 and O139 using culture methods, the direct fluorescent antibody (DFA) method and polymerase chain reaction (PCR) using a single-primer pair for the ompW gene and a semi-nested PCR selecting for the ctxA gene, encoding subunit A of cholera toxin. DFA results showed 37 V. cholerae O1- and 6 O139-positive samples. Vibrio cholerae O1 and O139 were observed on the scales of 4 of the 5 fish. The findings of the study provided in situ evidence for V. cholerae O1 and O139, predominantly as viable but non-culturable cells in the aquatic environment of Beira. This is the first record of the presence of V. cholerae O139 in the estuarine environment on the coast of Africa. The acute diarrheal disease, cholera, results from colonisation of the human small intestine by pathogenic strains of the gram-negative bacterium, V. cholerae. The clinical manifestations of cholera are almost entirely due to production of an A-B-type exotoxin that is secreted by pathogenic V. cholerae (Holmgren et al., 1971). People in Africa are increasingly impacted by cholera outbreaks caused by these bacteria. A total of 131 943 cases and 2 272 deaths were reported to the World Health Organization (WHO) in 2005 with Africa accounting for 58% of the global total (WHO, 2006). In more recent outbreaks in Angola, 82 204 cases and 3 092 deaths were reported as of May 2007 (WHO, 2008), and in Zimbabwe 88 834 cases were reported by 7 March 2009 (Mintz and Guaerrant, 2009; WHO, 2009). The African region accounts for over 90% of the total cases of cholera reported to the World Health Organization (WHO, 2007). Africa, where cholera outbreaks have been reported at an increasing annual rate since 1990, has been described as the new homeland for cholera (Gaffga et al., 2007). Vibrio cholerae serogroup O1, biotype El Tor has been responsible for epidemic and pandemic cholera in Africa and the rest of the world, with the exception of the Indian continent. (Alam, 2006a; Alberts, 1994). Vibrio cholerae O139, which emerged as a new epidemic cholera strain in south-east Asia in 1992 (Gupta, 2005; Alberts, 1994; Mahalanabis, 1994; Cholera Working Group, 1993) has notably not been reported in any investigation or any outbreaks reported from Africa. Research on cholera in Africa is incident-based with no concerted effort towards long-term surveillance in any of the cholera-prone areas. It includes, for example, studies on the existence of distinct strains (Scrascia et al., 2006; Sharma et al., 1979), cholera transmission mechanisms during outbreaks (Gunnlaugsson et al., 1998), inadequate patient treatment (Siddique et al., 1995), plasmid profiles and antimicrobial susceptibility patterns (Dalsgaard et al., 2001; Dalsgaard et al., 2000; Olukoya et al., 1995), effectiveness of an immunochromatographic dipstick test for the diagnosis of cholera (Wang et al., 2006), polymorphic conjugative integrative genetic elements that can confer drug resistance in non-O1 and non-O139 and other Vibrio strains in Mozambique (Taviani et al., 2008; Ansaruzzaman et al., 2004), outbreaks in South Africa (Hoque and Worku, 2005) and vaccination campaigns (Lucas, 2005). The knowledge gained through the incident-based research on the African continent falls short of the valuable information amassed over many years of systematic surveillance on the autochthonous nature and epidemiology of V. cholerae O1 and O139, conducted primarily in Bangladesh (Alam et al., 2006a; Huq et al., 2005). Vibrio cholerae is a natural inhabitant of estuarine environments (Colwell et al., 1994), where it persists predominantly in a non-culturable state (Alam et al., 2007). In this state the bacterium exhibits detectable metabolic function but cannot be cultured using conventional laboratory culture methods (Chaiyanan et al., 2007). Consequently, detection and isolation of V. cholerae from the aquatic environment is seldom successful. In general, V. cholerae is isolated from only 1% of water samples analysed during epidemic periods and rarely during interepidemic periods (Lizarraga-Partida et al., 2009; Huq et al., 1990). Molecular methods and fluorescent antibody techniques have, however, confirmed their presence during epidemic periods as well as inter-epidemic periods in areas where the cholera bacteria are endemic (Alam et al., 2007; Huq et al., 1990). Because there are few reports of detection and isolation of V. cholerae O139, it is generally accepted that O139 behaves similarly to V. cholerae O1 in the aquatic environment (Huq et al., 1990). The present study was undertaken to determine whether V. cholerae O1 and O139 are present in the aquatic environment in and around Beira, Mozambique. The occurrence of V. cholerae O1 and O139 in the Pungwe River estuary and in freshwater lakes, ponds and rivers, as well as on fish scales, is discussed here. The Pungwe estuary at Beira, the second-largest city in Mozambique, was chosen for this investigation because recurrent V. cholerae outbreaks in Beira indicate a ubiquitous and continuous presence of cholera bacteria in the area. Sampling, over a period of 15 months which included the inter-epidemic (dry season, April to October) and epidemic period (rainy season, November to March), was undertaken for the period December 2005 to February 2007, with the exception of April 2006 when no sampling was conducted. The sampling sites included 5 estuarine sampling sites (Fig. 1). Two sites were situated on shore (Sites 1 and 2). The rest of the sampling sites included 2 offshore sites (Sites 3 and 4), a sampling site located 4 km inland from the Pungwe River mouth at the Beira harbour (Site 5) and a city drainage canal receiving water consisting of a mixture of estuarine water and untreated city effluent (Site 6). As part of the survey a larger spatial area was selected where an additional 54 samples were collected once, at the beginning of (October 2006) and during the rainy season (January 2007). These samples included Pungwe River water taken at various sites, the estuary, ponds and freshwater lakes located within a 100 km radius of Beira. The samples also included water and sediments from the Buzi River, collected at a point 10 km upstream from the confluence of the Buzi and Pungwe Rivers. One surface sea water sample, in the Mozambique Channel, was collected 48 km east of Beira. Fish scales were collected from 3 sea fish, bought at a local market in Beira, and 2 freshly-caught sea fish, bought from fishermen on the Beira beach. A single-primer pair PCR for the amplification of V. cholerae species-specific gene ompW, encoding outer membrane protein (Nandi et al., 2000) and a semi-nested PCR for the amplification of the ctxA gene, encoding subunit A of cholera toxin (Du Preez, et al., 2003) were carried out. DFA, a fluorescein isothiocyanate-labeled antiserum specific for the detection of V. cholerae O1 and O139, with a minimum detection limit of 103 cell forming units (CFU) per millilitre, was used according to the manufacturer's instructions (New Horizon Diagnostic Corp. Maryland, USA). DFA results were visualised using a fluorescent microscope (Olympus model BX51). The lack of appropriate laboratory facilities in Beira necessitated shipment of the samples to laboratories in South Africa at ambient temperatures that ranged from approx. 20ºC to 33ºC. Shipment delayed analysis of samples by up to 2 days. To confirm whether or not the delay may have rendered the samples unsuitable for DFA and the PCR analysis, a series of experiments was conducted using fresh unsterilised and sterilised estuarine water from Beira. The unsterilised and sterilised estuarine water (500 m ) was inoculated with a non-toxigenic environmental V. cholerae strain, isolated from the Vaal River in South Africa, and V. cholerae O1 (NCTC 5941 obtained from the National Collection of Type Cultures, London, UK), to a concentration of 106 cells/ m . The spiked samples were incubated at 18, 26 and 35ºC for 3 months. Aliquots of the 3 samples were plated daily onto thiosulphate-citrate-bile salt-sucrose agar (TCBS; Difco), and incubated at 35 ± 2ºC for 24 h. Yellow colonies, considered as typical cholera growth, were confirmed as V. cholerae O1 or the environmental V. cholerae strain for both the non-sterilised and sterilised estuarine water on Days 3, 6, 9 18 and 48 using PCR. The same samples were also analysed for V. cholerae O1 using DFA. Detection using PCR was possible for up to 48 days and DFA detection was possible for up to 3 months for both Vibrio strains. Because the focus of this study was not on obtaining quantitative results but only on determining the presence or absence of V. cholerae O1 and O139, it was concluded that the delay in shipment would not have influenced the study results. Depending on the turbidity of each water sample, which ranged between 0.1 and 400 NTU, a sub-sample of 100 to 500 m was concentrated by filtration through 142 mm diameter 0.45 μ membranes (Sartorius). Membranes were eluted with 2 m sterile distilled water, and 10 μ from each eluant were analysed using DFA. Each sediment sample (10 g) was re-suspended in 10 m sterile distilled water and homogenised for 2 min. The homogenised sediment was left to settle for 3 min after which 10 μ of each of the supernatants was analysed using DFA. Fish scales were removed aseptically by scraping the outer surface of the fish with a scalpel in a tail-to-head direction. The scales were vortexed in 5 m distilled water for 1 min. The water (10 μ ) was analysed using DFA. Any samples that yielded positive DFA results were analysed for the presence of the ompW and ctxA genes using PCR. Positive results were observed when DNA was extracted by boiling followed by phenol chloroform and ethanol precipitation only. However, the detection limit was 1 x 106 CFU/100 μ , which was much higher than the nuber of cells actually present in the collected samples, as approximated by the DFA method. Positive and negative control samples were included for all analyses. We concluded that the consistently negative PCR results were caused by inhibitory substances co-purified during concentration and DNA extraction, and that more research would be necessary to determine the nature of the inhibitor and how to remove it. Ninety-nine samples, collected at 6 sampling sites, were analysed. Vibrio cholerae O1 was detected in 37 (37.4%), and V. cholerae O139 in 6 (6.1%) of the samples (Table 1). During the first epidemic period, 20 December 2005 to 24 February 2006, 13 of 30 estuarine water samples were found to be positive for V. cholerae O1 (43%). For the same epidemic period 1 year later, 20 December 2006 to 20 February 2007, only 3 of 36 estuarine samples were positive (8%). Vibrio cholerae O1 was absent from the samples analysed during May and July 2006, the interepidemic period, as well as during the epidemic period for the months December 2006 and February 2007 (Table 1). Vibrio cholerae O139 was detected in both the interepidemic and epidemic periods. At least 1 sample for the sampling rounds conducted for January, June, September and November 2006 was positive for O139 (Table 1). During the study period the frequency of detection for V. cholerae O1 was higher than that of V. cholerae O139. Results for the additional 54 samples collected in the surrounding areas of Beira showed the presence of V. cholerae O1 only, in 9 (32.1%) of the total of 28 water samples which consisted of river, estuary, lake and pond water, and 3 (11.1%) of the 27 sediment samples. Neither V. cholerae O1 nor O139 was detected in the deep sea water sample. Large nubers of V. cholerae O1 and O139 were detected in 4 of the 5 fish scale samples while co-existence of O1 and O139 was observed in only 1 of the 4 positive samples. Microscopic observations revealed the typical coccoid morphology associated with Vibrios in the aquatic environment. Individual clusters, clusters in association with debris and algae, as well as solitary cells, were observed in all the samples throughout the sampling period for both V. cholerae O1 and O139. 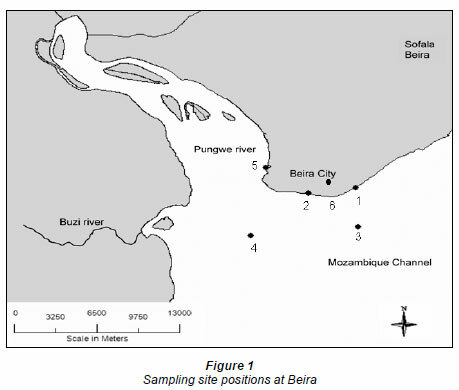 This study determined the presence of V. cholerae O1 and O139 in 154 estuary water and sediment samples, and water and sediment samples collected in and around Beira, Mozambique, in 2005 and 2006. Six sites in the Pungwe River estuary, where it enters the Mozambican Channel close to Beira, were sampled monthly for 15 months. The water in this area is turbid and high in nutrients. The impoverished population, living in informal housing erected on the beach, depends largely on fish netted in the estuary. The area is also the swimming area for local people and visitors. These communities have no sanitation facilities or piped drinking water. Taking these conditions into account, and the fact that water and sediment samples and fish scales were found to be positive for V. cholerae O1 and O139 during the epidemic and inter-epidemic periods of 2005 and 2006, it was not surprising that cholera cases were reported during this period. Culture methods and PCR analysis yielded negative results for V. cholerae O1 and O139. Previous studies reported difficulties in detecting cholera organisms using culture methods and it was shown that, on average, culturing yielded positive results only for 1% of the environmental samples analysed (Alam et al., 2006b). However, direct fluorescent antibody (DFA) detection (Hasan et al., 1995), which provides visualisation and enumeration of both culturable cells and viable but not culturable cells (Brayton and Colwell, 1987), showed positive results for both V. cholerae O1 and O139 in this study. DFA analysis showed the presence of coccoid cells (Chaiyanan et al., 2007, Alam et al., 2007), a morphological stage during which the cells cannot be detected with standard bacteriological methods. The presence of V. cholerae O1, in samples collected at the 6 sites in Beira (Table 1), spanned almost the entire sampling period (December 2005 to March 2007), which included 2 cholera epidemic seasons. The frequency of detection of V. cholerae O1 was lower during the second epidemic period (2006/2007). A possible explanation may be related to the prevailing climatic conditions, which, when compared to the previous 15 years' rainfall data (1990-2005), showed a lower than normal average monthly rainfall. Cholera outbreaks in Mozambique and other African countries often coincide with the seasonal rainfall or floods (Emsch et al., 2008). V. cholerae O1 or O139 as determined by PCR and DFA. These observations are consistent with reports elsewhere (Chaiyanan, 2007). Alam et al. (2006a) reported that V. cholerae, from freshwater ecosystems, held at 31ºC to 35ºC for 20 h in fact showed improved detection and isolation. Samples from freshwater rivers lakes and ponds and their respective sediments collected inland from Beira yielded positive results for only V. cholerae O1. These sources harbouring the cholera bacteria may be considered additional environmental sources of V. cholerae O1. However, intensive sampling and analysis will have to be undertaken to confirm the extent of their contribution to cholera outbreaks. The presence of V. cholerae O1 in the estuarine environment of Beira concurs with similar findings reported for toxigenic V. cholerae O1 in lake, river and pond water in Bangladesh (Alam et al., 2006a; Huq et al., 2005). Noteworthy is the detection of V. cholerae O1 and O139 in fish mucus and scale samples and the co-existence of O1 and O139 observed in 1 sample. Although V. cholerae O1 and O139 have previously been associated with raw seafood and fish (Siddique et al., 2006; Chen et al., 2004) and V. vulnificus with mussels, gills and fish mucus (Høi et al., 1998) and more recently in fish intestines (Sendorovich et al., 2010), we are not aware of other studies with similar findings. Recent information has shown that fish mucus acts as a nutrient source, from where V. anguillarum moves to the fish scale surface to form biofilms by synthesising exopolyssacharides (Croxatto et al., 2007). In vivo-formed biofilms of pathogenenic V. cholerae not only enhance survival in the aquatic environment (Alam et al., 2007), but, importantly, contribute to enhanced infectivity and environmental persistence (Faruque et al., 2006). Based on laboratory studies it has also been shown that biofilms are formed in response to unfavourable environmental conditions (Kierek, 2003a; Kierek, 2003b). Vibrio cholerae O139 is able to form biofilms more readily than V. cholerae O1, biotype El Tor, by increasing exopolysaccharide synthesis through repression of the flagellar gene transcription (Huq et al., 2008; Matz et al., 2005). Although the logical conclusion would be that O139 would be able to survive environmental conditions better than O1, and in theory should be present in biofilms in greater abundance than O1, no clinical or reported evidence for this currently exists. Standard methods to assess indicator bacteria assume that bacteria are mainly planktonic in nature. This can lead to a vast underestimation of potentially harmful bacteria in a water body. Droppo et al. (2008) recently showed that the numbers of E. coli bacteria in sediment can be 5 to 6 orders of magnitude higher than those in the water column. Estuarine and sewagepolluted sediments are known to harbour high numbers of bacteria (Shiaris et al., 1987, Hood and Ness, 1982). Beira is a harbour city where a number of daily occurrences may enhance the numbers of V. cholerae in the estuary. Examples include ship ballast discharge, known to harbour V. cholerae O1 and O139 (Ruiz et al., 2000; Kistemann et al., 2000) regular dredging (Grimes, 1980), tidal movement and extreme rainfall events (Ruiz et al., 2000; Kistemann et al., 2000). The extent to which these events contribute to the endemic aquatic reservoir of V. cholerae O1 and O139 of Beira is unclear. The potential risk of a pandemic spread of V. cholerae O139 was considered to be lower than initially expected after its first occurrence in India and Bangladesh (Siddique et al., 1996). More recently an escalating association of V. cholerae O139 with outbreaks of cholera has been noted, which indicates a shift in the outbreak propensity of V. cholerae O139 (Siddique et al., 1996). The possibility of a V. cholerae O139 outbreak is seldom considered in Africa. Ineffective disease reporting systems, inadequate environmental monitoring, inadequate treatment and the lack of appropriate clinical test materials increases the risks of cholera outbreaks. The situation is further exacerbated by a lack of knowledge regarding plankton and fish as potential hosts for infectious cholera bacterial communities (Cottingham et al., 2003). Significantly, exposure to the O1 serogroup does not protect individuals against O139 cholera (Morris et al., 1995). Thus in the event of a V. cholerae O139 outbreak, matters will be worsened by the fact that people in Africa have no immunity against this bacterium and few management options exist for when such an outbreak is realised. With the potential changes in spatial and temporal spread of diseases and the ecological and sociological changes associated with predicted climate changes (Paz, 2009; Serdas, 2007; de Magny et al., 2009; Lobitz et al., 2000; Lipp et al., 2002) the potential for V. cholerae O1 and O139 outbreaks cannot be ignored. Importantly, accurate identification of cholera epidemic strains is paramount for vaccination programmes implemented in outbreak areas. One of the shortcomings of our study was the inability to confirm V. cholerae O1 and O139 bacteria using molecular techniques. Presence of these bacteria was however confirmed using fluorescent antibodies, a method that has been proven to be very specific for V. cholerae O1 and O139 (Brayton and Colwell, 1987; Huq et al., 1990) and is considered to be a reliable method by many researchers working with cholera bacteria in environmental samples (Lizarraga-Partida et al., 2009; Alam et al., 2006b). To our knowledge, this study is the first documented record of the presence of V. cholerae O1 and O139 on sea fish scales along the African coast and elsewhere. Notably this study is also the first documented record of the presence of V. cholerae O139 in the coastal waters of Africa. This study, for the first time, provides in situ evidence for V. cholerae O1 and O139 in the aquatic environment, predominantly as viable but non-culturable cells in water and sediment samples, in African coastal waters. Vibrio cholerae O1 and O139 was present in both the epidemic and inter-epidemic periods indicating a year-round reservoir, similarly to that reported for studies performed in Bangladesh. In-depth understanding of V. cholerae ecology can enhance efforts to reduce human exposure to this pathogen and thus minimise the health risk this poses. Received 28 January 2010; accepted in revised form 3 September 2010.